Full Disclosure: I did not complete this project this month. When you see the pics, it will be obvious, because I was pregnant with Baby Girl when I wore this costume last Halloween. However, I believe it ties in really well with The Thrift Project, and it’s another great way to use thrifted t-shirts. 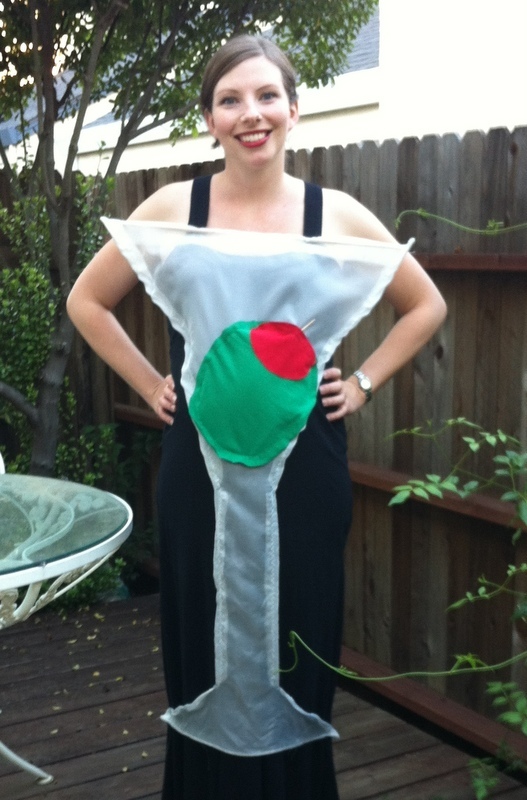 And maybe there’s a mama-to-be looking for a fun Halloween costume. Here you go. I used to be part of a Bunco group. It was fantastic! These ladies are the best, and when I started playing Bunco with them, I was still working, so getting together with them was the best stress reliever after a long day teaching. After Baby Girl was born, it just got a little harder to make it to Bunco every month, so I quit with hopes of still being able to sub from time to time. So last year, we had Halloween Bunco. I love costumes, so I REALLY LOVE dressing up for Halloween. I was almost 8 months pregnant with Baby Girl at that time, so I wanted to come up with something funny, but not pregnant nun or bun-in-the-oven. I asked Husband if he had any good ideas, and, without skipping a beat, said, “I’m seeing a martini and and olive.” AWESOME! Husband is the best! But how to execute that?! I found a few martini-and-olive costumes online (for inspiration – you know I’m going to make my own if at all possible), but I didn’t like anything, so I got out my sketch book and started planning. I also needed a dowel rod (for the toothpick), which I thought I had in the garage, but I didn’t, so I borrowed on from a friend. Once I had everything, I got to work. 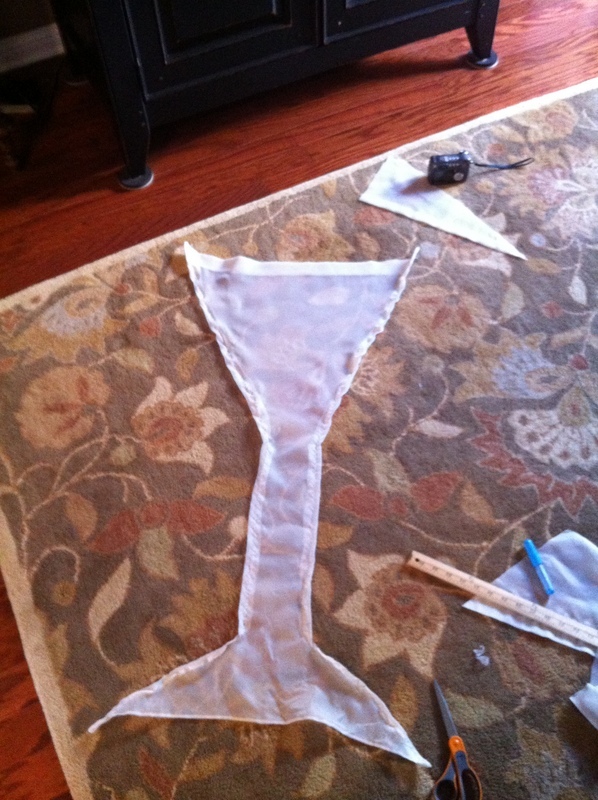 The martini glass was the most challenging part. I didn’t do any measuring, I just freehanded the shape on a sheer curtain and cut it out. I folded the edges under and stitched a quick hem to keep it from unraveling – nothing fancy. I used the t-shirts to create an olive shape about the size of my pregnant belly. I freehanded these, too, and trimmed as needed to fit properly in the bottom of the martini glass. 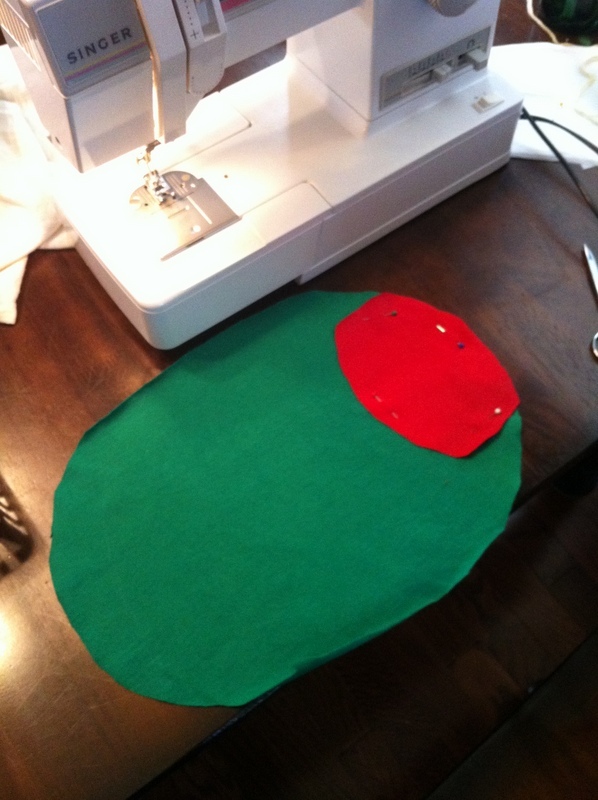 I pinned the red pimento on top of the green olive and sewed it down. Then I pinned the olive to the curtain and sewed it in place. LOVE this costume – maybe my favorite ever! 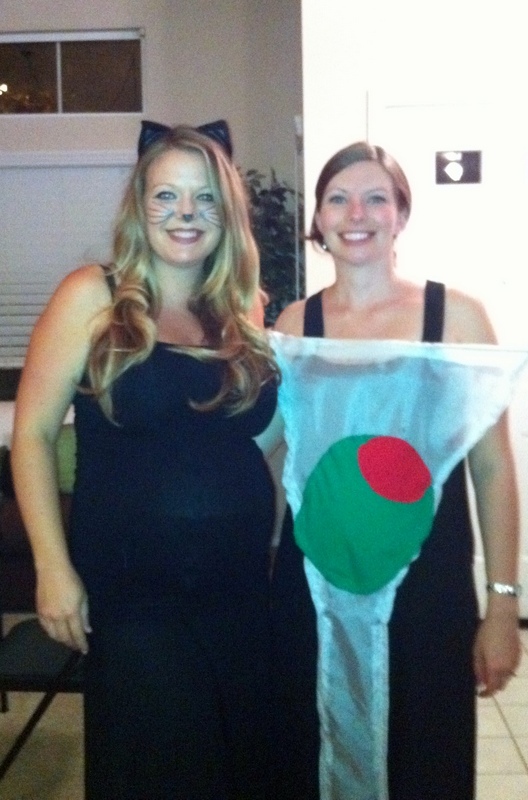 And here’s another pic with my friend, Ashley, who was also pregnant and looking adorable, wearing part of her daughter’s cat costume. Anybody going to a Halloween party this year? Tell me about your costume ideas! This post is part of a 31 Day series. Find all the posts in this series here. Want to receive updates by email? Click “Follow” in the lower right corner and keep up with how The Thrift Project is coming along. mee-oww! Great one.. this was such an innovative costume and you looked fabulous in it! I am not not loking too shaby myself. My costume, however, was not very innovative. I realy need to learn to sew!